Toyota Motor Corporation (Toyota) announces the launch of its completely redesigned Toyota Crown in Japan and the start of sales at all nationwide "Toyota" dealers (including for the Tokyo area Toyopet and "Toyota" dealers). Since its debut in 1955, the Crown has been a symbol of innovation. As illustrated by TRC featured in the 8th generation Crown (1987) and ABS in the 9th generation Crown (1991), cutting-edge technologies that are now used in many vehicles featured in the Crown before any others on the road. The new 15th generation Crown enters the world as Toyota's first-generation connected car equipped with a standard DCM. 24-7 vehicle connectivity with customers brings the relationship between cars and people, even the community, to a completely new level. Services focused on safety, security, comfort, and convenience, such as maintenance notifications based on real-time driving data, will be offered at the most suitable time for each customer. Style and vehicle performance such as driving, turning, and stopping were also refined based on TNGA. For driving in particular, testing was carried out at Germany's famed Nurburgring circuit, regarded as the world's most challenging race track. Outstanding handling realizes responsive driving performance and exceptional vehicle stability in a range of driving conditions and scenarios, at low or high speeds, on smooth or rough road surfaces. 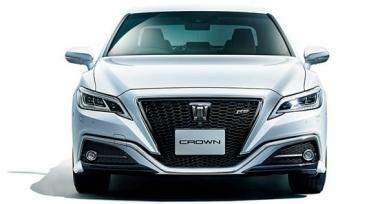 The Crown, Japan's renowned high-end car, has continued to evolve and push the limits, offering even more advanced driving performance and cutting-edge connected functions. New Crown vehicles are all equipped with a dedicated DCM as standard, and T-Connect Service is offered free of charge for three years so all customers can experience the connected service. Customer safety and security services such as HELPNET and e-Care, as well as services that improve driving life comfort, such as Toyota's Operator Service, are offered. LINE My Car Account for setting destinations with the Crown or smartphone applications and MyTOYOTA for T-Connect Drive Diagnosis to check safety/eco-driving level via smartphones will be launched. With the aim of creating a sports sedan combining a bold look with sophisticated elegance, the new Crown was designed with a proportional low slung nose, the hallmark of front-engine rear-wheel-drive cars, and a sleek, elegant profile that flows smoothly from the roof to the trunk, featuring six side windows.RS Grades are equipped with LED sequential turn signals (front and rear) that broadly illuminate a wide periphery, and feature a mesh front grille, front bottom trim design that highlights the low center of gravity and delivers a wider profile, side skirts that contribute to enhanced control stability, special 18-inch aluminum wheels, four exhaust tail pipes, rear spoiler, and black door frames to further promote the sporty appearance. A moderately sized cockpit and spacious interior create a comfortable space that allows the driver to focus on driving. The simple yet fastidiously designed high-quality interior and cutting-edge devices create a point of distinction while attaining a sophisticated, modern atmosphere. To add further appeal, rich textures and impeccable design are adopted throughout, enlivening the senses and bringing texture, movement, sound, and attractiveness to the fore. A new dual display incorporates an 8-inch display positioned farther back for ease of viewing even while driving and a 7-inch display installed closer to the driver for ease of operability. Platform: A new platform based on TNGA is used. The powertrain is positioned lower to achieve a low center of gravity, and aluminum hood fenders and optimized distribution of weight between the front and rear deliver outstanding inertia specifications. A front high mount multi-link suspension and rear multi-link suspension, optimized steering rigidity, use of aluminum die casted front suspension tower, and application of a significantly greater amount of structural adhesive further enhances body rigidity to realize responsive handling and a stable, comfortable ride.